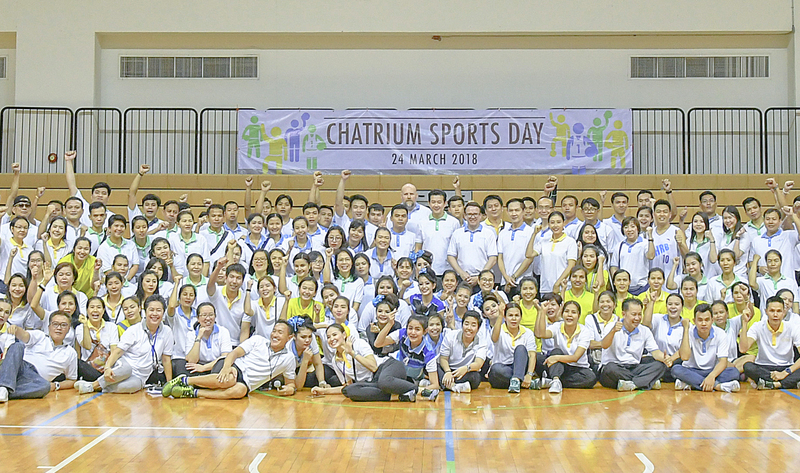 Chatrium Hotels & Residences management and employees led by Mario Beyer, General Manager of Emporium Suites by Chatrium, Patrick Manthe, General Manager of Chatrium Hotel Riverside Bangkok and Tanasak Vanichavit, Hotel Manager of Maitria Hotel Sukhumvit 18 came together for Chatrium Sports Day at CU Sport Complex. Chatrium’s properties in Bangkok comprise Chatrium Hotel Riverside Bangkok, with its captivating riverside charm and amazing Chao Phraya River views, Chatrium Residence Sathon Bangkok, a contemporary city oasis combining family friendly facilities with luxury and serenity, Emporium Suites by Chatrium, where one can embrace iconic living in the heart of Bangkok’s shopping district, and Maitria Hotel Sukhumvit 18, where you can stay savvy and still have easy access to the Sukhumvit action. Employees came from across Bangkok to join the team-building action at CU, and all were rewarded with a day of fun and harmony.